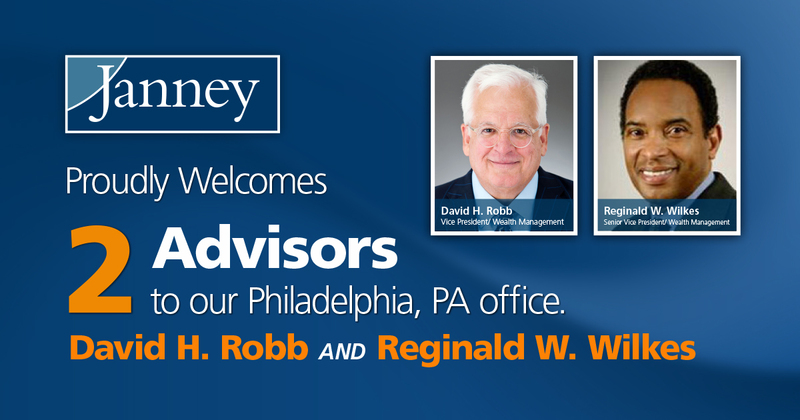 PHILADELPHIA, PA – November 27, 2017 – Janney Montgomery Scott LLC (“Janney”), a leading full-service wealth management, financial services, and investment banking firm headquartered in Philadelphia, PA, announced the hiring of David H. Robb and Reginald W. Wilkes to the firm’s Philadelphia corporate headquarters. Robb, Vice President/ Wealth Management, is a 32-year industry veteran, and was previously affiliated with Wells Fargo Advisors. Wilkes, Senior Vice President/ Wealth Management, is a graduate of Georgia Institute of Technology and former NFL linebacker. Wilkes has over 29 years of experience and was previously affiliated with Merrill Lynch. Janney’s headquarters are located at 1717 Arch Street, 21st Floor, Philadelphia, PA 19103.